Swarnivar (Bengali for self-sufficiency) is one of the oldest grassroots partners of AID in West Bengal. Since its inception in 1989, Swarnivar has become a resource organization for many grassroots groups in West Bengal and surrounding states. 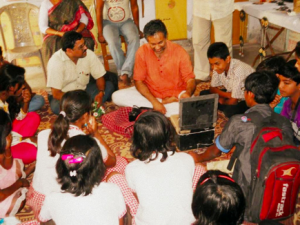 KKB is a unique program to train the youth to become agents of positive change in their communities through non-formal education and participatory learning. 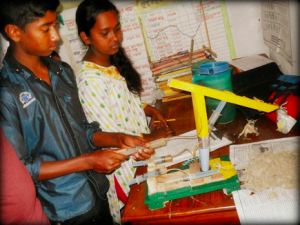 KKB works with adolescent youths in 6 project villages and in 50 high schools within the 24 paragnas region. 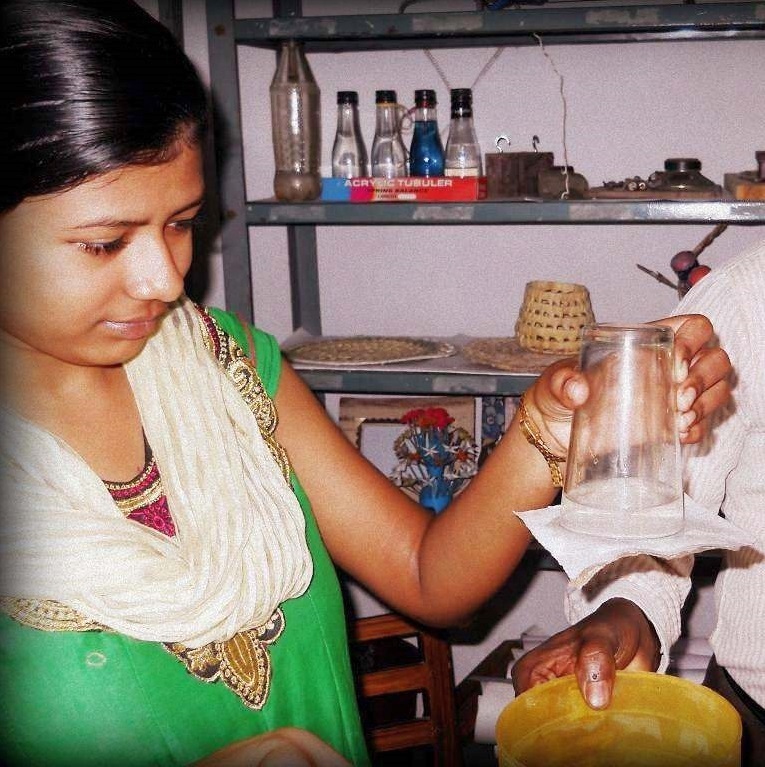 Through teaching techniques that students can relate to in their daily life, KBK imparts education on wide range of subjects including science, organic farming, environmental conservation, and waste management. The youth explain Pascal’s law – pressure at the end of each syringe will be transmitted equally to the end of the tube which will create motion in all three axes enabling the model earthmover to pick up the sand and swivel to another point before dumping it. This model created by the KKB won a state-level award. Swarnirvar’s methods on making science easy and fun for children have slowly found its way into the text books in the state. The children have made this solar cooker with things that have been thrown away. Rice can be cooked in close to 2 hours in this cooker. Youth also actively participate in maintaining cleaner neighborhoods. KKB youth manage seed banks. Swanirvar works with 500 farmers on sustainable agriculture, which includes moving away from chemicals and preserving the local bio-diversity. Swanirvar works with the farmers in preserving, documenting and disseminating these varieties. KKB youth manage seed banks and a pest gallery. 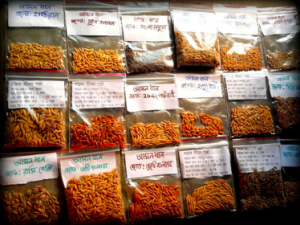 Villagers can loan different kinds of seeds from these banks. When villagers find a pest they are not aware of, they bring it to the pest library. Youth explain to them what that pest is and what steps they could take to prevent any harm to the crops. KKB youth also receive training in organic farming. Youth do organic farming in open space around their house. 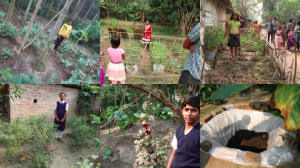 In pictures below, children pose in front of their own kitchen gardens. KKB youth also learn about climate change and adaptation by conducting local surveys on fuel use, socio-economic conditions, biodiversity and weather conditions. 90% youth members will plant nutrition gardens in their homes. For all the classrooms have dustbins and the bio waste will be transferred into manures which in turn will be used in the school kitchen gardens. 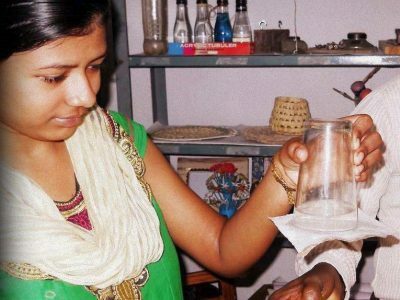 To establish resource rooms for science models, survey database and seed banks in high schools. To have weather information boards in all schools. To develop an outline of an alternate basic rural curriculum for classes VI- VIII along with evaluation systems.